Back in the heat of the kitchen. 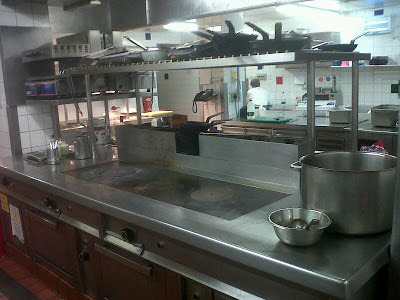 Some thirteen years ago I stopped working in the hotel and catering world and started a catering in food manufacturing. I left behind the stress and hassle of the fact that everyone wants to eat at seven thirty to eight and not matter what you do that will happen, your seven o’clock arrive at late and your eight thirty arrive early, no matter how well you stagger the bookings. I left behind the staff shortages; skills shortages and general problems of staffing that had existed since I started to work in catering back in the eighties. 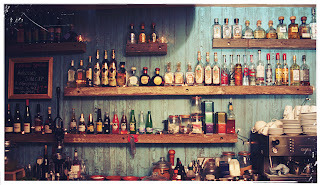 I left behind the long hours and working weekends, and grew very comfortable in my nine to five job. Not that it was nine to five at first but it was in the end and that is the main point. But always I missed something about working a busy night getting to the other side and knowing that it all went well in the end. Lucy Boyd, cook, food writer and head gardener for Michelin-starred Café Petersham Nurseries, has risen to the challenge set by local charity School Food Matters to create a dish with students from Collis Primary School in Richmond from whatever they find growing within the school grounds. Kitchen Garden Ideas was designed by School Food Matters to celebrate the two life skills of growing your own food and cooking simple nutritious meals, and aims to inspire children and families to have a go at both. Fifteen lucky students from Years 1 & 2 took part in the cooking session with Lucy and Head Chef at Petersham Nurseries, Cat Ashton, after a trip round the school garden to harvest some early summer produce all currently grown by the Gardening Club at Collis Primary. Thousands of species of edible fish live in rivers all around the world, so it’s hardly surprising that over 125 different types can be found in the fresh river waters of the United Kingdom. Despite the current interest in locally sourced ingredients, regional recipes and even foraging, few chefs have as yet to explore and serve food from this rich and diverse supply...until now. 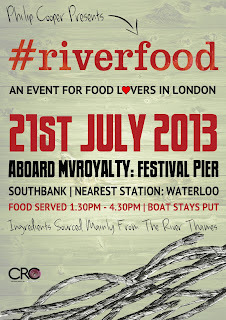 #RIVERFOOD is the brainchild of trio Phil Cooper, Arno Marsman and Andrea Britton of Coopers Restaurant Consultants. During a career spanning 30 years, Phil Cooper has established himself as one of the most successful chefs in the UK, working with respected names such as The Waterside Inn, Claridges, The Mirabelle and Le Manoir aux Quat' Saisons to name a few. 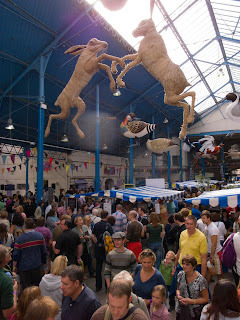 The 2013 Abergavenny Food Festival takes place over the weekend of 21 and 22 September. Some of the most daring adventurers of the culinary world are convening on the Welsh Borders for a two-day slap-up celebration of the craft of food. Join these alchemists – the producers, performers, artisans, cooks, writers and children’s entertainers. Start your own adventure. Try something new and nurture your own skills. It’s an immersive day out for the whole family and there’s free entry for children under 16 (if accompanied by an adult). 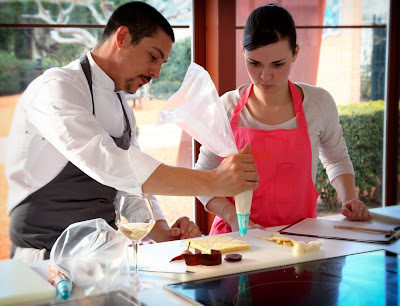 Contemporary gastronomic hotel Le Saint-James, in Bordeaux, France have announced a new special offer - 15% off a gourmet class at their on-site cookery school Le Côté -Cours when you book a stay at the hotel. The offer is valid to any guests who book a stay in any room at the hotel between now and October 19th 2013 and prices start at €21.25 for children and €38.25 for adult classes. Le Saint-James, home to Michelin starred Chef Nicholas Magie, and designed by Jean Nouvel, is located on the sloping hills of Bouliac with breathtaking views over Bordeaux city, the vineyards below and the River Garonne. The hotel comprises of 15 individual, contemporary rooms and 3 suites, all designed to appreciate the panoramic views around the hotel, and with beds positioned to take in the spectacular panorama of Bordeaux. Lonchesitos Banados Torta filled with chicken on a tomato and chipotle sauce topped with coriander. The town of Whitstable, nestled on the North Kent coast, has been synonymous with oysters for hundreds of years. Probably longer in fact. Two thousand-year-old oyster shells excavated in modern Rome have been traced back to this traditional seaside town and oysters remain an intrinsic part of Whitstable’s character to this day. 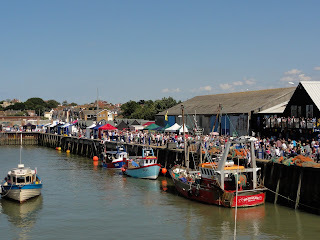 The Whitstable Oyster Festival is an annual celebration of Whitstable’s most famous export and there’s a whole host of activities based around heritage & community, food & drinks, family and art. For seven full days, from Saturday 27th July, Whitstable will come alive with things to do, see, taste & enjoy.